Quite possibly the coolest Mentalism routine ever! After more than two years of planning and prototypes they have finally cracked it with the ultimate one-man version of Andy Nyman's classic effect. A spectator is invited to the stage to help test your abilities in the new defense technique known as "Dead Zoning" and after explaining that it is a combination of heightened body language reading, plus the ability to imagine a 'Dead Zone' on the person you are looking at - in essence it allows you to know whether someone poses a threat to you just by looking at them. The technique is now taught to bodyguards, secret service agents and airport security personnel. At this point you explain that you imagine the "Dead Zone" as a target and then proceed to stick a picture of a target onto the spectator then ask him to imagine that he is an assassin and draw his attention to the case on the table. 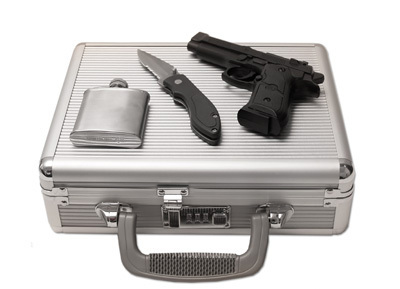 You explain that it contains a selection of weapons that may be used by an assassin and ask him to open the case and take a look inside. You turn your back to the spectator & instruct the spectator to place each of the weapons into his pockets. Once done, you turn to face him and ask him to walk away from you. After a couple of steps you stop him and by staring at the 'Dead Zone' you CORRECTLY reveal which weapons are in which pocket! As the applause fades you explain that sometimes if you really tune into the 'Dead Zone' you can know what is going to happen before the thoughts even enter the other persons head. You ask him to remove the 'Dead Zone' target that you stuck on him & open it up. It is a prediction that correctly states which of the weapons he would place in which pockets with perfect, 100% accuracy every time! Dead Zone Pro is truly geared towards the professional performer and each unit has been carefully hand crafted to ensure both quality and reliability. Case & Weapons specially adapted by Christopher Taylor from Canada! Receiver with light or vibrate options! Three different targets to create a different outcome at repeat performances! Full instructions and professional script by Andy Nyman! Simply enter your details below and we will send you an e-mail when “Dead Zone Pro by Andy Nyman” is available to ship!